Previously, on MinerBumping... 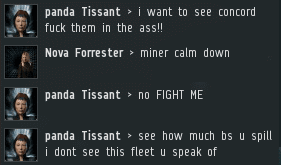 In an effort to prove her fortitude and help save highsec, Agent Nova Forrester embarked on a miner-bumping campaign in Kamio. 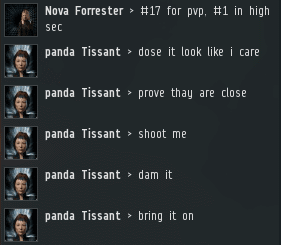 It was immediately successful, but the system was home to a disgruntled miner named panda Tissant. Using the power of the bump, Agent Nova put a stop to Schuylar Windsong's mining operations. However, Schuylar refused to buy a permit--and panda was infecting him with her heresies. Unlike the Code, miner heresies tend not to last; they're poorly thought out. Consider panda and Schuylar's exchange here. Suppose it's true that no one can enforce their control in space 24/7. If so, then it's equally the case for the New Order and the nullsec powers like the Imperium. 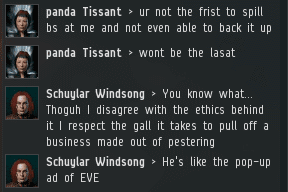 Yet no one denies that coalitions can and do hold space in nullsec, despite not being able to enforce control in that space 24/7. 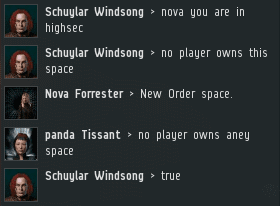 Thus, the New Order is also able to claim highsec as its own. On the other hand, if one can enforce control in space 24/7, then the New Order is entirely justified in its efforts to do so. 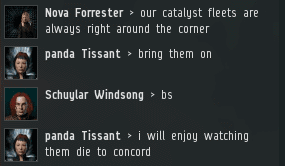 Either way, our Agents rightly claim highsec space. So much for the miners' heretical beliefs. Nova cautioned the miners that if they returned to the asteroid belts, they might very well end up getting ganked instead of merely being bumped out again. The mighty CODE. 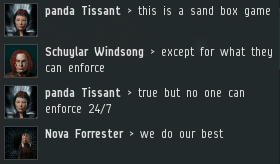 alliance has already ganked over 75 trillion isk worth of non-compliants. What made these miners think their ships were so special? 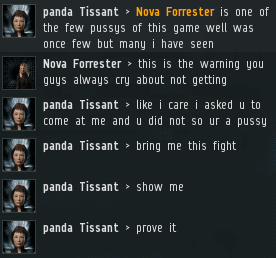 panda demanded proof. Carebears, if you want the ability to summon gank fleets on command, put down your mining lasers and learn how to FC a gank fleet. When miners hit rock bottom, they tend to go into a downward spiral of self-destruction. 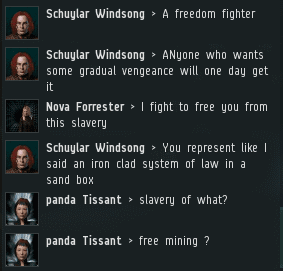 I believe this miner truly wanted to be ganked. However, Agent Nova was still on her miner-bumping mission. For now, the miners would need to remain docked or risk further bumps. If they were going to be ganked, it wouldn't be by Nova. Our Agent noted that panda brought further condemnation upon herself--and her fellow miners. When ganked, they complain that they weren't warned. 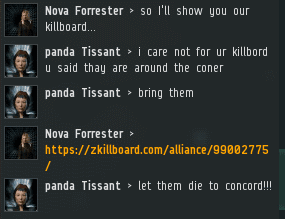 When warned, they complain they're not being ganked. What a bunch of Goofuses. Meanwhile, Nova was notified of a private convo request. 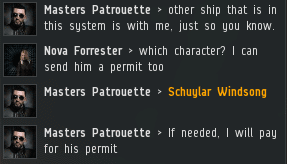 To her surprise, she received 10 million isk on Schuylar's behalf. With the benefit of a mining permit, maybe he would calm down. Alas, as the old saying goes, a Goblok and his permit are soon parted. Schuylar didn't deserve the kindness of his friends--the one who bought a permit for him, and the Agent who taught him what civilization is. The rebellious miner chose to abandon civilization and common sense in favor of some half-baked anti-Code resistance idea: "Gradual vengeance"! What an inspiring slogan. Agent Nova's three-hour bumping campaign reached its end. She had shut down illegal mining in Kamio during that time and sold two permits--and revoked one. Had she changed anyone's heart, though? Make that three permits. And yes, our Agents always win the battle of hearts and minds. When an Agent of the New Order speaks, everyone listens. And excellent work to all the other Knights of the Order that have recently passed their first trial! Kenny still thinks he is god. Well done Agent Nova! 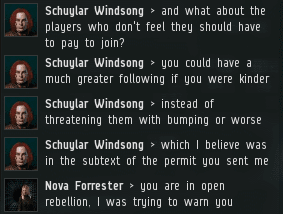 I especially like how you reminded the miners about the warning you were graciously providing. Please - stop being a pleb, and learn to write in legible English. Your current writing ability borders on the learning difficulty level. Whilst we recognise miners struggle with basic literacy, we still expect you to at least make some effort at communication. Here is a useful resource to get you started. Ask somebody responsible to print it out for you. Why are you crying Kenny? "if you enjoy yourself too much in many ways unknown to most... well, that can become an addiction"
You're a strange one Kenny. I too enjoy myself in many ways, unknown to most. I'm most definitely an addict. I found CHODEanon today guys. There I was, on a cold winter's afternoon, sat gazing longingly out of the window with one thing on my mind, CHODEanon's location. "If I can't find him, I'll never be able to give him the help he so desperately needs!" I said to myself, with just a hint of consternation. Then, all of a sudden it hit me, the stark realisation. I stood up, turned around, and looked down. Lying there right before me was CHODEanon himself. Floating in the toilet bowl. 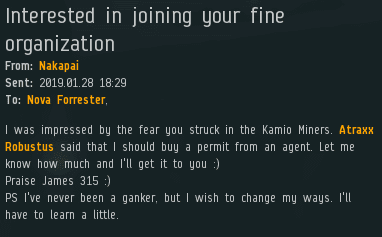 To all you tough talking tanked skiff pilots mining in James 315 territory. We are the reason you are not in a hulk. Stay mad and keep crying daily. I keep hearing squeeks when visiting the comments section. Kudos to Nakapai. He did not only pledge support by buying a permit, he actually went out there and enforced the Code. Good job, pilot! Nakapai actually just joined NOL!